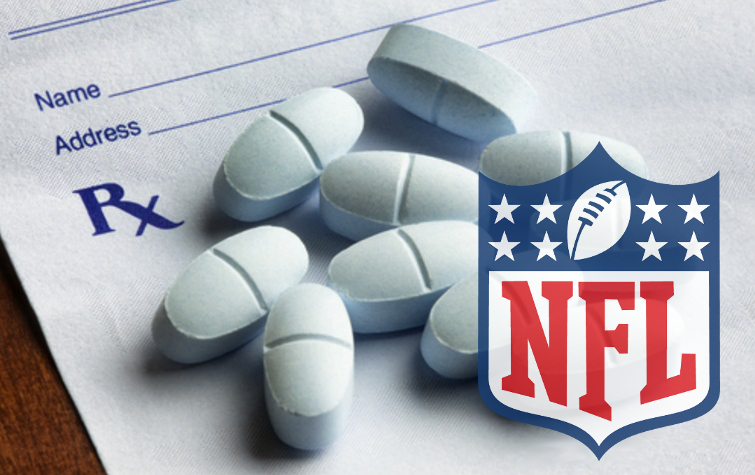 The NFL and its member clubs have been engaged in ongoing lawsuits seeking accountability for the damages to former players resulting from improper and illegal use of prescription painkillers to keep injured players on the field. Note: Since this article is primarily a case update, if you haven’t followed it closely, I’d recommend reading my 3-part deep dive on the NFL’s painkiller lawsuits to get up to speed. As I reported previously, on February 3, Judge William Alsup denied in part and granted in part a motion to dismiss filed by the member Clubs. While Judge Alsup dismissed the RICO, or racketeering allegations as time-barred, and along with the RICO charges, the claims of conspiracy among the member clubs of the NFL. He did, however leave the door open to a future conspiracy claim in stating, “If, as discovery proceeds in this matter, evidence surfaces indicating the existence of a conspiracy, or indicating that some clubs lied to plaintiffs, then the Court will at least consider allowing plaintiffs to amend their complaint to re-add a conspiracy claim.” Judge Alsup said that he would require allegations against each team to be pled with specific particularity, as had been done against the Lions, Raiders, Broncos, Packers, Seahawks, Dolphins, Chargers, and Vikings, and that he would let those pleadings move forward, granting leave, or permission for the plaintiffs to shore up their complaint in regard to allegations against other teams. 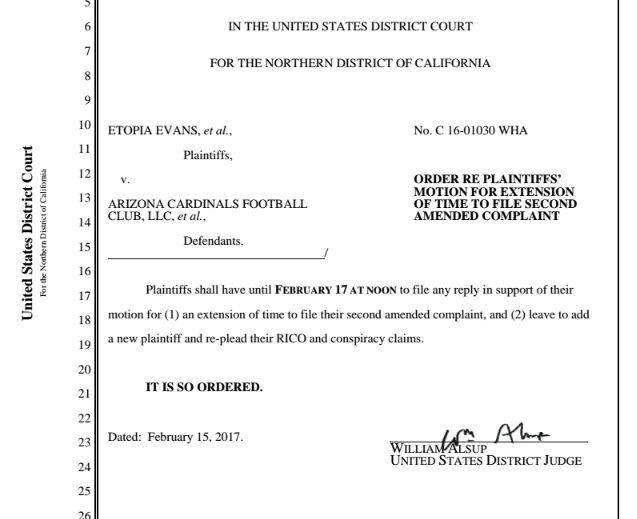 Since Judge Alsup made clear that this would be the last opportunity for the players to “plead their best case in all respects,” on February 14, Plaintiffs’ counsel William Sinclair filed a motion asking for an extension of time, in order to prepare his best case. Sinclair also requested “leave to add a new party, Carlos Rogers, who on behalf of a putative class would be filing in addition to intentional misrepresentation and concealment claims, a claim pursuant to the Racketeer Influenced and Corrupt Organizations Act (‘RICO’) and to re-plead their conspiracy claim.” Rogers was the ninth overall pick in the 2005 draft by the Washington Redskins, for which he played 78 games through the 2010 season. During this time he had 8 interceptions and over 200 tackles. He played 48 games for the San Francisco 49ers from 2011 through 2013 and was named a starter on the 2011 NFC Pro Bowl roster as well as second-team All-Pro that year by the Associated Press. For the 2014 season he played seven games with the Oakland Raiders. Sinclair established a date of March 3 as the time he would be prepared to present his case in a second amended complaint. Sinclair additionally stated that since the statute of limitations was the only issue addressed by the court in regard to RICO claims, and since Rogers’ injuries fall within the applicable statute of limitations period, that he should be allowed to proceed as a part of this case as opposed to separately. 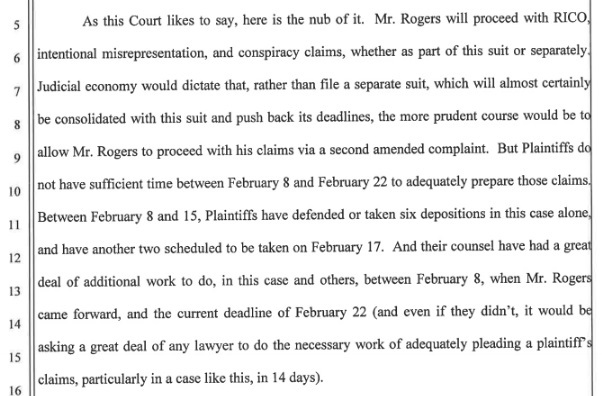 He said that Rogers only became a named Plaintiff as of February 8, and as such if the motion should be denied, counsel would have only one week to prepare his case. He also clarified that granting his request would not delay the May 18 date established to determine class certification. Typically in the legal realm courtesy is granted by opposing counsel when a request for additional time is made – especially one as brief as seven working days, but courtesy did not prevail in this instance. The following day, on February 15, the NFL’s member Clubs responded by opposing the motion for a time extension and the addition of Carlos Rogers as a named Plaintiff. While the Clubs correctly stated that the RICO and conspiracy claims had been dismissed with prejudice, meaning they could not be re-filed, the new plaintiff meeting different criteria had not been known at the time. The Defendant Clubs state that no reason was given for moving beyond the October 31, 2016 deadline for adding additional plaintiffs and that the plaintiffs have shown no acceptable reason that additional time should be granted. In response, later on February 15, the court issued the following brief order. Sinclair stated in the filing that he felt the court’s resources would be better served to permit an extra week to allow for the addition of Carlos Rogers, but regardless of the court’s ruling on the extension a lawsuit would be filed on his behalf. On February 21 the court denied Plaintiffs’ request for additional time. In the order, Judge Alsup wrote: “The February 3 order expressly denied leave to amend plaintiffs’ RICO claim because ‘plaintiffs have already had ample opportunity to investigate and plead a timely claim under RICO” . . . Yet, for all the time spent and ink spilled between both this case and Dent, its predecessor, plaintiffs’ counsel did not bring forth Rogers to secure plaintiffs’ RICO and conspiracy claims.” He noted that Rogers wasn’t mentioned at the January 26 hearing regarding Defendants’ motion to dismiss and that plaintiffs’ counsel had only asked for more time to evaluate discovery documents. Judge Alsup appeared to be annoyed when in reference to Plaintiffs’ request, he wrote, “essentially that, if the Court does not acquiesce to their request, Rogers will file a separate lawsuit and force everyone to go through the process of consolidating the two actions and delaying deadlines as a result.” He acknowledged, as Plaintiffs’ stated that Rogers would probably at some point be added to this lawsuit, as Sinclair had pled, however he opined that they would “presumably need more discovery on Rogers,” and it would push back the established class certification date of May 18. If the second amended complaint is filed today, as expected, I’ll have an update on new pleadings shortly. In a request for comment from Plaintiffs’ counsel, I was given no additional information outside the statement “Happy to send the complaint to you when it is filed,” in regard to Carlos Rogers lawsuit.